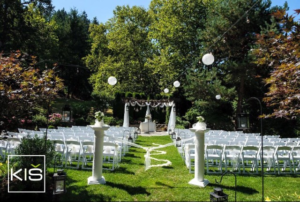 Nestled among two acres of mature trees and landscaped lawns, Weddings on the Hill in West Linn provides a classic, tranquil, and romantic setting that will make your wedding dreams come true. Whether you desire an outdoor wedding or an indoor affair, Weddings on the Hill can accommodate your wishes. We take your vision with our expertise to give you the day of your dreams. Your day will be customized and tailored just for you, from start to finish, and it’s all included! View our packages to see what’s right for your special day. Congratulations on your upcoming wedding! Let us help you with your planning. 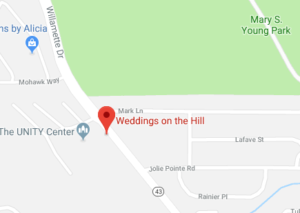 Weddings on the Hill is conveniently located in the heart of West Linn on Willamette Drive (Highway 43). We are approximately three miles south of Lake Oswego, or 1.5 miles north of I-205, (exit 8, Lake Oswego/West Linn). Our venue is often used as a destination wedding location as it is centrally located between Seattle and California, and we have couples from all over the country. Built in 1937, Weddings on the Hill was formerly a private estate and is now available for weddings and private events. Learn more about what’s right for you by viewing our packages or contact our Wedding Coordinator Terri to schedule a tour. Inside, open rooms across the front of the property provide an airy, light-filled space for sit down meals or standing receptions. The grounds outside, with over two acres of mature trees and landscaped lawn. *Terri Stranderg at (503) 307-0343 (text me!) to make an appointment to view the facilities.